A strikingly beautiful wine, the 2010 Foradori is firing on all cylinders today. Sweet red berries, flowers and mint are some of the notes that emerge from the glass. The 2010 is a decidedly bright, focused wine laced with high-toned aromatics and flavors, all supported by an attractive vein of saline-infused minerality. This is one of the most elegant, refined wines I can remember tasting here. 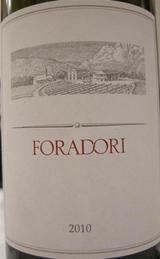 The Foradori is essentially the same wine that was previously marketed as Teroldego Rotaliano. Best of all, it is a fabulous value. A pure beam of black cherry is accented by ground anise and clove, sandalwood, pomegranate and graphite notes in this mouthwatering red. Supple tannins show on the lingering finish. Drink now through 2020. 833 cases made.